For reasons of standardizing the standard of quality of this Internally Heated Type Air Dryer, we abide by the set industry norms and guidelines. The finest raw materials and modern machines applied in its making, ensures the product’s sturdiness, durability and performance. In addition, the offered range is known to be marked at the best rate possible. 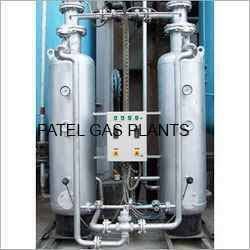 Known in the market for manufacturing, supplying and exporting of a wide range of supreme quality Gas Plants & Filters, Patel Gas Plants (Generation) was established at the wide area of land of Vapi district of Gujarat in the year 2010. For the purpose of manufacturing these gas plants, the finest quality of stainless steel and other basic material are used. These gas generation plants offered by us are manufactured by using advanced machinery and in compliance with the industry set norms, regulations and guidelines. Offered by us at industry leading prices, these gas generation plants offered by us are highly demanded in the market for their high performance, minimum maintenance and longer functional life. We offer services of Repairing and Maintenance. As per the specifications provided by the customers, these gas generation plants and spare parts offered can be customized. Offered product range is inclusive of Gas Generation Plants, Compressed Air & Gas Dryers and Gas Plants & Filters. We export our products South Africa, UK, USA. Since the inception of our company, we have been backed by a team of skilled and experienced professionals. They are selected by our management through rigorous procedures after completely assessing their skills, knowledge and experience. In addition to this, they are trained at regular intervals of time to enhance and polish their professional and technical skills in the most efficient manner.